I am grateful to Sofia Strömbergsson (Ph.D. student at Kungliga Tekniska högskolan in Stockholm) for sending me the link to a new paper on the nonword repetition task: Melby-Lervåg, M., Lervåg, A., Lyster, S.-A. H., Klem, M., Hagtvet, B., & Hulme, C. (2012). Nonword-Repetition Ability Does Not Appear to Be a Causal Influence on Children’s Vocabulary Development. Psychological Science, Online First, accessed October 6, 2012. The results of a 3-year longitudinal study of 219 children are reported in which nonword repetition and vocabulary performance was measured at regular intervals. Simplex models and latent growth curve models were used to show that each variable was very stable over time with earlier performance predicting later performance in each domain. However, neither variable had significant longitudinal influence on the other over time (in fact the strongest cross-loading that was observed was from vocabulary to nonword repetition at the earliest time point although the link was not statistically significant). 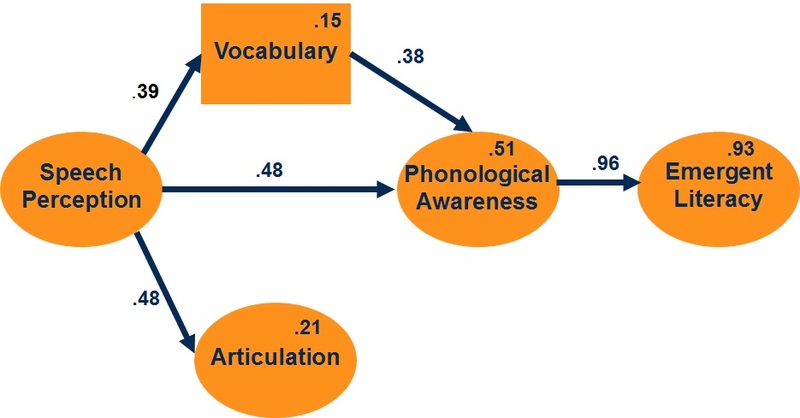 The result is at variance with the hypothesis that the phonological loop is a fundamental cognitive mechanism that underlies language learning in general and vocabulary development in particular. The outcome is of interest to me because when Meghan Grawburg and I published our model of the correlates of phonological awareness in children with speech delay in 2006 (inserted Figure is simplified version of the published LSE model ), Hartman (2008) suggested that our model was deficient due to the exclusion of phonological memory as a variable; it was further suggested that phonological memory would explain both vocabulary and phonological awareness skills in our model whereas we had shown that phonological awareness emerged from the interaction of children’s speech perception and vocabulary skills. We argued in reply that phonological memory, as measured by a nonword repetition task, reflects the quality of children’s phonological representations and would most likely factor with our measure of speech production accuracy or our measure of speech perception. Therefore it rather pleases me to see the two variables developing along independent paths despite their initial correlation in this new paper by Melby-Lervåg et al. These authors point out (as we did in Rvachew and Grawburg, 2008) that training studies are required to most definitively test hypotheses about possible causal relationships between phonological memory and vocabulary skills. Two new nonword repetition tests are available to support these kinds of studies. First, Shula Chiat has developed the Preschool Repetition Test which can be used with children as young as two years (see also, Chiat and Roy, 2008). I really like this one because it takes prosody into account. Second, Shriberg and colleagues have developed a Syllable Repetition Test that is made up solely of early developing phonemes so it is very appropriate for children with speech problems. Following from our model and the intervention work that we are doing in our lab right now I would predict that vocabulary interventions in young children with speech and language delays would lead to improvements in phonological processing skills (including nonword repetition and phonological awareness skills). I’d be surprised if training phonological memory transfers directly to vocabulary skills but it would certainly be an interesting study! I stress however that these would be interesting studies from an academic point of view and not good clinical practice. In terms of clinical relevance, I think this new study supports my general rule and that is to always treat the primary functional goals of interest – if the child’s speech is unintelligible target speech accuracy. If there are concomitant problems with phonological processing by all means work on those skills at the same time given that phonological processing skills are important precursors to both speech accuracy and reading. In this case however, focus on those skills that have the greatest functional relevance – word identification/error detection tasks are directly relevant to speech perception and self-monitoring for the improvement of speech accuracy; phonological awareness is essential for the acquisition of decoding. If the child’s vocabulary size is small it will be necessary to target lexical knowledge as well. Under no circumstances would I recommend targeting phonological memory or any so-called executive functions as a means of promoting language or cognitive skills (e.g., morphosyntax, phonology, reading and so on) as is often recommended by the purveyors of so many popular ‘brain training’ regimens. The other point of clinical relevance has to do with screening – nonword repetition has proven to be an important marker in genetics studies but it is not by itself a clinically useful screening or diagnostic tool. Most of the time, as SLPs, we want to know whether a given child has a clinically significant delay in speech or language functioning right now and to answer that question standardized tests of articulation accuracy and language ability are still the best tools in our kit. It remains to be seen whether nonword repetition tests (in combination with other measures) will prove to be a reliable means of sorting speech and language caseloads into psycholinguistic subtypes that require distinct approaches to intervention – I have been hopeful that this might be possible but I am not convinced that the science is there yet.